While browsing the Internet, you might have noticed annoying advertisements provided by Coupon Monkey. If you have, we are here to inform you that you have an adware application named Coupon Monkey on your computer. It promises great deals and coupons when shopping online, however, it only serves to annoy you. We strongly believe that it’s best to remove Coupon Monkey from your computer. 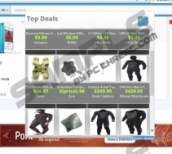 Coupon Monkey is distributed in the same way as all other adware. It gets on your computer via freeware bundles most of the time. While you do get some kind of useful program you want when you install a bundle, the problem is that several pieces of additional software tag along if you don’t pay enough attention when installing it. Removing all the programs you don’t want can be a real hassle. We recommend getting a professional spyware removal program to help you uninstall any software that is considered annoying or even slightly dangerous to your security. In the future, make sure to choose Custom installation and to uncheck any boxes offering to install programs you don’t want. Once Coupon Monkey gets on your computer, it starts tracking your web browsing. While your personal information doesn’t concern the Coupon Monkey developers, some other kinds of data are a different matter altogether. This adware pays special attention to your Internet search queries, things you look for on shopping websites and links you click on. If the third-party partners of Coupon Monkey can offer some kind of similar product to the one you looked for, you get an ad, offering you a deal. These ads are really annoying and could be quite annoying to remove. We strongly recommend to avoid clicking ads. Coupon Monkey developers aren’t responsible for the content of its third-party partners. You could get even more adware or even actual malware downloaded to your computer after clicking such links. While one piece of adware isn’t that difficult to delete, they get increasingly more difficult to remove when you have more of them. When trying to remove Coupon Monkey from your system, you can do it automatically and manually. Automatic removal with a professional tool is vastly superior, because it will scan your whole system and delete any threats it finds. If you choose to remove Coupon Monkey manually, you will only uninstall this program alone. You can never know for sure if your computer security was breeched by any more threats, unless you run a full scan of your system. Nevertheless, the instructions for manual removal are included below. Right-click the lower-left corner of your screen and go to Control Panel. Click Uninstall a program, select coupon monkey, and uninstall it. Go to Start menu and click Control Panel. Click Uninstall a program and uninstall coupon monkey. Quick & tested solution for Coupon Monkey removal.